Before I jump into this post, I’d like to explain hashtags to those who are not familiar with them. Hashtags are made up of the # symbol and words or phrases that can be searched on social media to reveal all posts, by people who have used them, in one place. For example, if you do a Google search for #ChurchToo, you will see search results for articles and links to social media posts where individuals have shared this hashtag and their attached message regarding the topic. The messages of the #ChurchToo hashtag is specifically what I’m speaking about in this blog post today. So what’s this all about? Recently the hashtag #MeToo was created for people to share their stories of sexual harassment, abuse, and assault. In some cases women and in other cases men who were assaulted shared their stories while also revealing the names of people who assaulted them. Since the #MeToo movement began, there have been several celebrities, athletes, and prominent public figures who have bravely spoken out about their experiences. The results have been favorable as their abusers have been reprimanded by their employers and society as a whole. Now, the #MeToo movement has spread to the church. There are several victims of sexual abuse, assault, and harassment who are using the hashtag #ChurchToo to tell their stories of past abuse. This is a very sensitive, but real issue that I believe pastors need to be prepared to address. 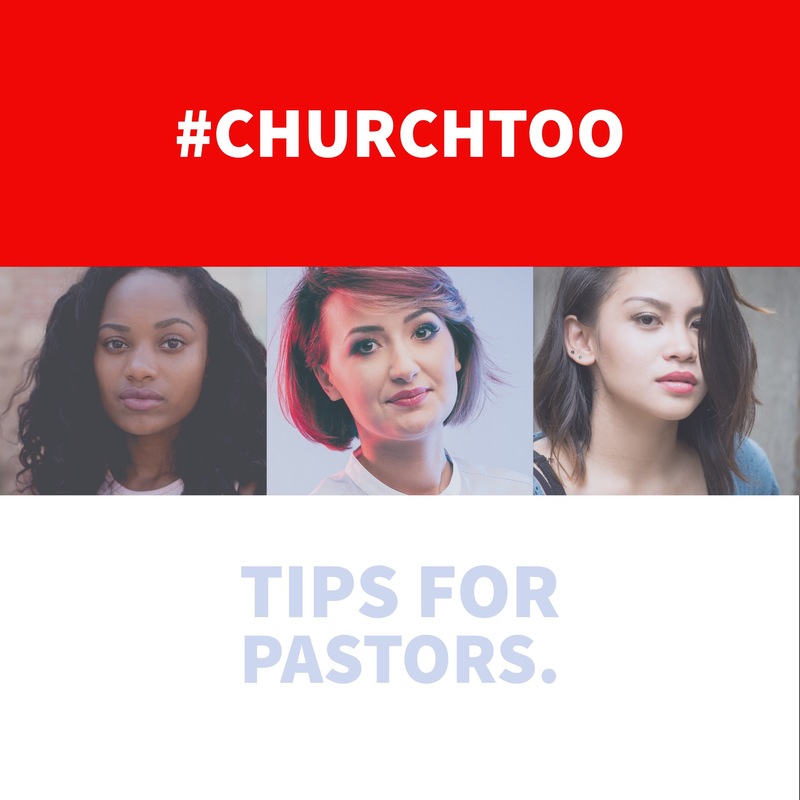 Even if offenses haven’t occurred in your specific church, it’s imperative to be knowledgeable about the #ChurchToo movement and know how to help. In some of the cases shared in the #ChurchToo movement, adults have come forward sharing incidents that happened when they were teens or children. Pastors will need to minister to those adults as they wrestle with the spiritual, emotional, and mental trauma they’ve hidden for years. There also exists a possibility that victims of sexual assault will leave the church where they were abused and join our churches. So, it’s necessary that we understand that this matter exists. #ChurchToo victims will need to be ministered to and pastors need to be prepared. With this in mind, let me share a few thoughts for pastors to consider. In Nehemiah 1:5-7, Nehemiah fasted, prayed, and confessed the sins of God’s people. He confessed the sins of God’s people, even the sins he did not commit. This issue is bigger than we are as individuals. We need to pray for God to heal the victims and heal the church. We should not attack or downplay the stories of abuse that are being shared. We should not try to diminish the severity of the pain victims feel. We should not begin victim blaming, saying they brought it on themselves. Instead, we should pray for them. We should acknowledge their stories. We should validate their feelings and help provide counsel for them. Some of the victims have been scarred and need to experience emotional healing. Pastors who have not committed these wrongs may encounter people who have been hurt by other church leaders. We should apologize on behalf of the church. Think about it; if the waitress at a restaurant mistreats someone, there is a chance the customer may blame the entire restaurant. If that customer calls on the manager to share their grievance, the manager will apologize even if he or she didn’t commit the offense. In the same way, we are ambassadors of Christ to the victims and must address the grievances of #ChurchToo victims. We can’t remain neutral on this subject. We as clergy must condemn the sexual abuse that has happened in the church. If necessary, we need to say it from the pulpit. We can’t try to cover this up for the sake of saving face. Instead, we must let those who have been affected by these grievances know that the church stands for what is right. If you’re a leader who has abused your position and influence by sexually preying on others, repent. I’m not talking about making a public display to try to arouse sympathy from others. I’m not talking about making a statement to try and save your career. I mean getting before God completely exposed and open to his gaze upon your soul. Acknowledge the eternal penalty of your offense and allow God to change your heart. Then have the courage to face those you’ve violated, hear their pain, validate them, confess your wrong, and petition them for forgiveness. Let’s respond to this #ChurchToo movement with compassion. Some victims have estranged relationships with the church because of sexual assault. Others have struggled to have healthy, life-giving relationships with their spouses and families because of the scars they’ve received from misguided church leaders. We may not be able to do anything about the past, but we can help victims become restored and whole going forward. Thanks Pastor for sharing on this very important subject that has been needed to be addressed. I wish you were my pastor. One of my pastors harrassed me, manipulated me, emotionally exploited me, and then fled to the other side of the country. Multiple other women came forward. He managed to change his email, cell phone number, and cut himself off from my church and community. Rumor has it he is using state funding to become a public school teacher. My elder board has chose to name me publicly, insist I drop his plate or they will not except me back , put me through a ten-month repentance process that I failed, have me do a public confession, had me meet in coffee shops with women who were looking for 20 points of repentance, Cut me off from the church , became angry with my family for embracing my pain and forgiving me. Thank you for being the hands and feet of our Savior and shepherd! May mercy and grace reach the wounded for His glory! Rachel, Thank you for having the courage to share your story. I’m sorry to hear about your harassment and the difficulty you faced in the wake of that harassment. Unfortunately, you may never be able to find true justice, but God is able to help you heal and find peace. I pray that the Lord will guide you to a personal resolution about the situation and that he will send the right people in your life to validate your feelings.